Every month, the Carolinas District produces and sends out a district mailing to all Key Clubs across North and South Carolina. Ever since the spring of 2015, this has included the Carolinas Blueprint, a ten-page publication composed of newsletters by the four members of the Carolinas District Executive Board. 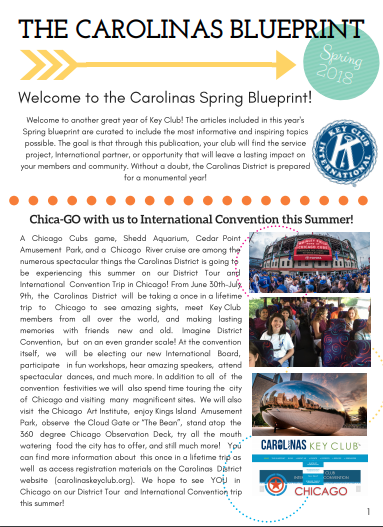 This Key Club year, however, the Carolinas Blueprint is a twelve-page publication. This publication covers information spanning from upcoming district events to the Major Emphasis Charities of Key Club International. This page will store all past issues of the Carolinas Blueprint. Feel free to peruse them and hopefully learn something new about Key Club!